The game opened with the Bobcats coming off a huge win yesterday versus Marist and back here again in Hamden for the start of a doubleheader. 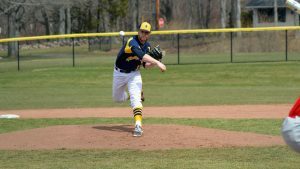 The pitching matchups were set with two right handed starters set to take the mound in Quinnipiac’s Robbie Hitt and Marist’s Scott Botches. The first inning opened up with Hitt having a great opening sequence. He established first pitch strikes and got two big outs to shortstop Matt Batten with a ground out and a line out. Evan Vulgamore contributed with a nice sliding catch into shallow right field to close out the inning. The Bobcats were determined to get ahead early to start the home side of the first. After Botches hit the leadoff man, Evan Vulgamore singled up the middle to put two on with no outs. Batten moved the runners over after a soft ground out. 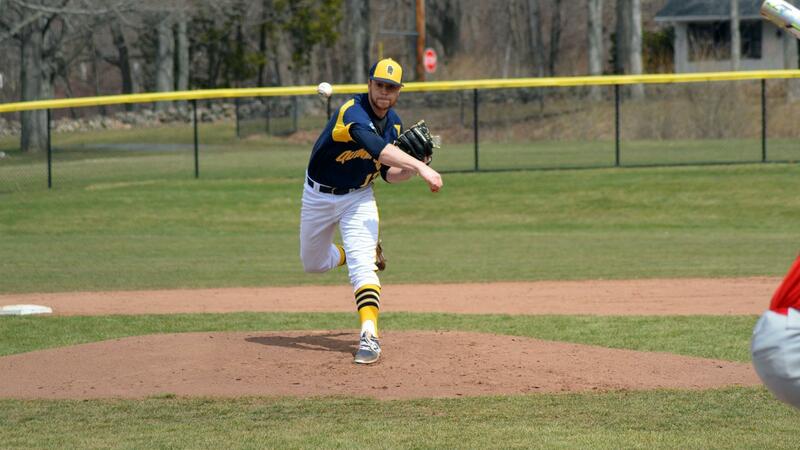 However, Botches would find his spots and retired the Bobcats four and five hitters to close out what looked like a promising inning for Quinnipiac. The second inning started off in fashion with Ryan Nelson applying a great tag at first base after a Joey Burns overthrow. The Red Foxes couldn’t seem to get anything going as Hitt continued to look dominant on the mound. Batten made a great play sliding to his left and Hitt retired the side one, two, three to close the top of the second. The Bobcats got one hit in the bottom half of the inning as Brian Moskey singled but it was quiet from there on as Botches continued to roll. The top of the third started with a deep line drive to center and Hitt was saved from possible extra bases as Palodino made a great diving catch to register the first out. He registered another out himself and Hitt struck out the last batter. Botches was dealing as he closed the bottom of the inning with a strike out, line out and a ground out. As the fourth got under way it was clear that today’s match up was going to be a pitcher’s duel. Hitt was dealing as he registered two outs before a grounder to third got through both Burns and Batten for his first hit allowed. However, he would get out of the inning with a fly ball to right. Botches comes right back with a great sequence of pitches and gets Burns to struck out to start the inning. However, Liam Scafariello came up and hit an absolute bomb to left field to get the Bobcats on the board 1-0. Botches battled right back as he came back with a strike out right after the home run only to give up a big double to Brian Moskey. Andre Marrero came up huge with a single to shallow right center and that scored Moskey. Cruz contributed to the hit parade with a single to move Marrero over and continue what seemed like the big inning Quinnipiac needed. They finished the fourth up 2-0. Hitt started the fifth with back to back strike outs and didn’t seem phased by the long wait in between innings. After a walk to Taveras, Hitt came back and finished the inning where he started with a strike out. Botches got three up and three down as he registered an infield fly and two ground outs respectively to Quinnipiac’s two, three and four hitters. Marist entered the top of the sixth down two runs and coach John Delaney still had Robbie Hitt on the mound as he was rolling. After striking out the first batter, Anthony Lazar singled to left and Marist finally had some life. A pitch in the dirt let Lazar advance to second and a good back up from Quinnipiac’s defense helped keep him there. However, Hitt settled in and registered his seventh strike out and got out of the jam with a fly out to center. The Bobcats looked to get some insurance as they came to bat in the bottom half of the sixth. Marist continued to roll with Botches and had Matt Rubayo warming up in the pen incase things got shakey. Nelson started the offense for Quinnipiac with a single to center for his first hit of the game. Moskey got on after Botches hit his second batter of the game and then Cruz grounded into a double play to end the inning. Marist then came to bat with their last hopes at tying the game. Robbie Hitt stayed in the game for the Bobcats after only giving up on hit on 90 pitches and seven strike outs to this point. Marist led off with a single from Rouse to right center and followed with another blooper to no man’s land between shortstop and the left fielder. Robbie Hitt was pulled after that in what was a strong performance. Matthew Oseija came in for Quinnipiac with three innings pitched so far this season. He gave up a bunt to who Kocinski moved the runners over on a bunt and set up Marist with a second and third opportunity with one out. Mike Davis took over after Oseija gives up the bunt single. He came in and got a huge strike out to send Marist to their final out. Pagano battled to a three-two count but Davis came back with a huge strike out to send Quinnipiac to the second game ahead 1-0 in today’s series, defeating the Red Foxes 2-0.